While most of us old-timers know the game by heart, that isn't necessarily true for new players. Additionally mods often have quests that are somewhat different. As informing the player of what exactly he is supposed to do isn't easy (setting emails is an absolute pita, and voice lines are hard to do), a different way to give at least some rough clues on what he is supposed to do is needed. I also promised I would expand the uses of intel. The issue is that there are a few things that we could buy information on, but that is useless without a place to display that information. This button toggles the quest & intel map overlay. If you do not see that button because you are low-res peasant, you can also press q.
I've added symbols for all quests (I hope I got them all). The sector description window now has a small text that gives a hint on what you are supposed to do. Additionally, you can now buy information on planned creature raids and on the location of the terrorists (after Carmen told you to find them). A very important and user-friendly part is that the quest-based symbols are lua-based. This means that anyone can add, alter or remove data to be displayed. -- we list all locations Martha mentions... even though he will never be present at some of them. Misdirection! The symbols are stored in Interface/IntelMapSymbols.sti. If possible due to my pitiful drawing skills, I added ones that indicate what one should do. If you don't like the symbols, add better ones, otherwise shut it. This has been added to the trunk in r8560 and GameDir r2424. The new exe will require the new GameDir, as I've added new sti files and script functions. IF YOU USE A NEW EXE WITH AN OLD MOD WITH OUTDATED SCRIPTS, YES, THAT MOD WON'T RUN. STOP DOING STUFF I SAY WON'T WORK AND THEN COMPLAIN IT DOESN'T WORK. When I find or buy the intel about general location will it be displayed on the map (will the exact sector be marked somehow)? EDIT: just found the answer in "enemy generals" thread. As informing the player of what exactly he is supposed to do isn't easy (setting emails is an absolute pita, and voice lines are hard to do), a different way to give at least some rough clues on what he is supposed to do is needed. Why should the player know exactly what he's supposed to do or where he's supposed to go? The game world gives clues, and the objectives can be found through organic exploration based on the clues. That's an important part of JA2, figuring it out yourself based on the guidance the game gives you. That is adequate and should not be tampered with. Magical markers appearing on the map breaks all of that. It robs the player of the joy of discovery. I don't agree with this feature at all. 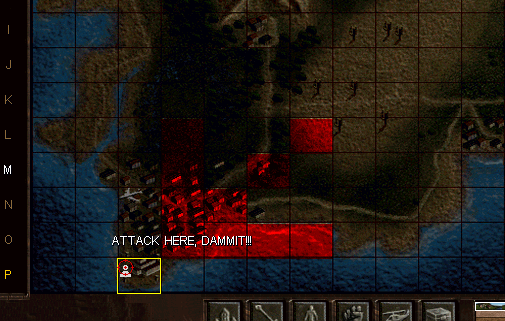 Jagged Alliance 2 is an old school game; it's not supposed to be The Witcher 3, where stuff gets marked on the minimap. I feel that this is an affront to the game's design philosophy. Dumbing down like this is what's wrong with gaming nowadays. 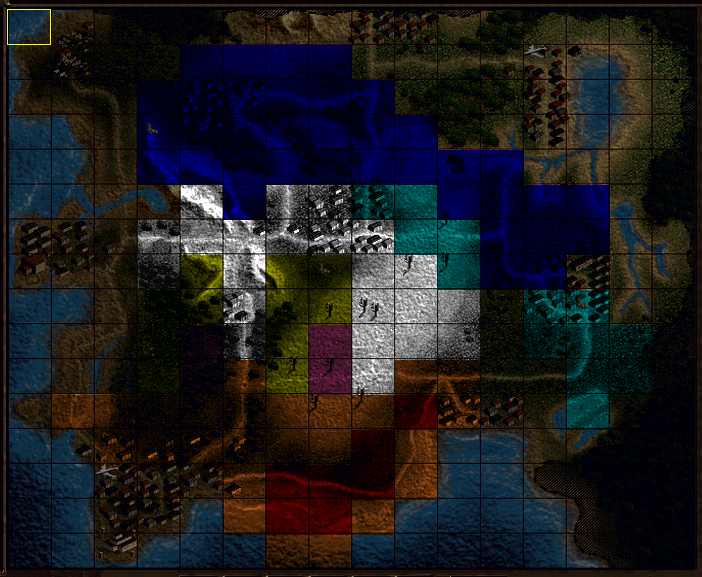 Paying attention to the game world and listening have been displaced by map markers. 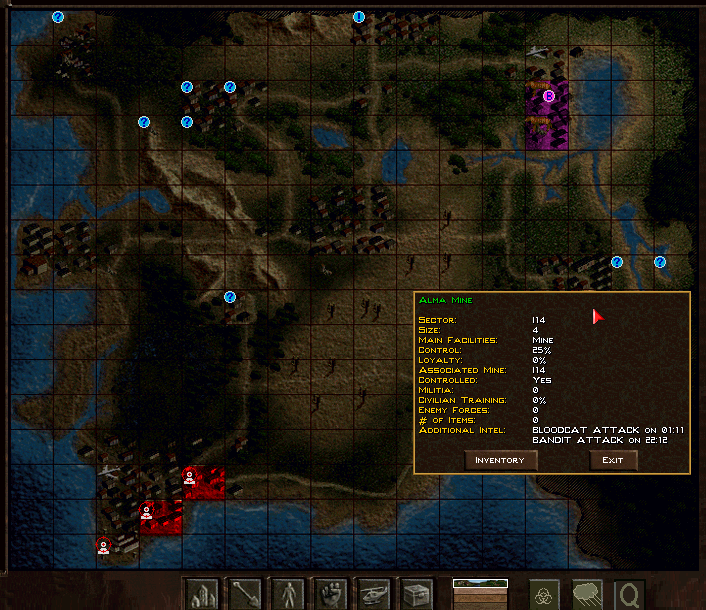 Jagged Alliance 2 encapsulates everything that is good about old school gaming. Modern conventions such as marker-based questing have no place in it. This stuff wasn't necessary in JA2 in 1999--and it's not necessary today. I usually like what you implement and respect the effort you put into it, but this is disappointing. This is desecration. I feel like this mod project is beginning to defeat its original purpose and start losing its aim, which, as far as I know, was to retain the spirit and focus of the original game while mainly implementing quality of life upgrades. Borderline-spoiling quests is too fundamental and, in my opinion, crosses the line. This is beyond simple quality of life and minor features. Well. One of the purposes is to allow adding info for new quests - as I said and you quoted, editing emails is a royal pain (new ones need to be coded in), we have no way to display permanent notes and voicework is even more complicated. So... where else would one put this information? If I recall, most of these hints are only displayed once the player has reached the appropriate quest stage. For example, once Martha tells us to look for Joey in San Mona and Estoni, I don't see the harm in telling us Joey might be in San Mona or Estoni (he's never in Estoni, but Martha says so, so that place gets a marker too). Additionally, this is also used to display info on creature/bandit raids (relatively new feature) and uncovered enemy VIPs, which needs to be displayed somewhere. The alternative would be to shortly display them on the website and expect the player to make a pen&paper note. Besides, if one does not want to use it, just... don't use it. and modders who want players to play with active brain could just not add the required script lines. I see this as pointless bloat in the game. It should at least be disabled by default, imo. And by disabled I mean it shouldn't show up in the UI at all. Maybe put it in the .ini file as FALSE by default, under "Witcher 3 mode". Those who really want this (why?) can have it. But more importantly, I'm of the opinion that it's in disharmony with the game's design philosophy. For example, the mechanic at the airport who wants you to find Skyrides says "the guy had the smell of swamp about him" or something along those lines. It's purposely a somewhat vague clue. You removed the steps of the player: 1) understanding that he needs to find a swamp based on the dialogue clue by applying reasoning 2) looking for swamp sectors. You basically removed all gameplay from the quest except actually going there. You removed the satisfaction the player would get from finding it himself; you removed the "ha, I figured this out, and did it myself!" sense of accomplishment. Hence, I think it should absolutely be disabled by default as it can ruin, or at least water down, the new player experience. I'd imagine most people nowadays play the game with 1.13 for the first time. It's very likely that new players won't necessarily even realize that this isn't a native feature and thus may get a diluted experience without even knowing. I have no ill will against you personally nor do I say any of this to disrespect your work. I just see this particular addition as harmful and am voicing my honest concerns. I want this mod to be the best it can be, and I feel that this addition is a dire misstep. Oh, and by the way, I'll let you know that you're in a situation here where you're very susceptible to https://en.wikipedia.org/wiki/Effort_justification. Recognize consciously through introspection if you're guilty of it, and evade it if so. I think this feature in principle could be very useful, especially to modders - but I also partially agree with Multihog that if applied to the vanilla quests it verges on 'bloat' and perhaps runs counter to the game's original design philosophy. Perhaps if it were only applied (by default) to the newer 'intel' features like VIP locations and bandit raids, but NOT the vanilla quests (with the INI option available to turn quest intel on), that would be a more agreeable solution? Perhaps if it were only applied (by default) to the newer 'intel' features like VIP locations and bandit raids, but NOT the vanilla quests (with the INI option available to turn quest intel on), that would be a more agreeable solution? Thumbs up to this. The vanilla content should remain separate. For intel, this addition makes sense. I've been playing the game for a while and whilst I in the meanwhile have done some quests and clearly remembered some of these them; location, what to do etc.. the objectives or the goal isn't always clear. An example: the hillbilly farm quest. A woman says something IMO vaguely about the location of the farm that I hadn't visited because it wasn't clear. I think that addition of such a feature, as this, most definitely will make things easier because in essence visual clues are very handy and are sort of ''natural'' in a way to us. so that is probably one of the best arguments against use of the markers. Indeed. You're not supposed to necessarily find and do everything in JA2 on your first playthrough. The beauty of it is that you can still find new things after having finished it multiple times. Introducing a visual marker layer ruins this and makes it yet another ho-hum checklist questing game instead of the beautiful and organic experience that it was designed to be by Sir-Tech. We're treading on thin ice here and risking messing up the game in a profound way. In JA2, the only thing that's mandatory is taking out the queen. Everything else is optional. This "vagueness" is by design so that the player has to use a bit of deduction, which also leads to a high sense of accomplishment. That's what's missing from new games. We don't want to lump JA2 into that category as well! This is like a fork in the road regarding what you want this mod to be. This addition will surely cause controversy among the fanbase. It risks alienating a fair chunk of it.